Sorry, I've been a bit MIA lately but I've literally been missing in castle-seeing action in England the past week or two. For everyone still in need for inspiration, I thought - inspired by some of my recent CastleMemories - we could discover a little more of Sweden and its royal and noble sights. 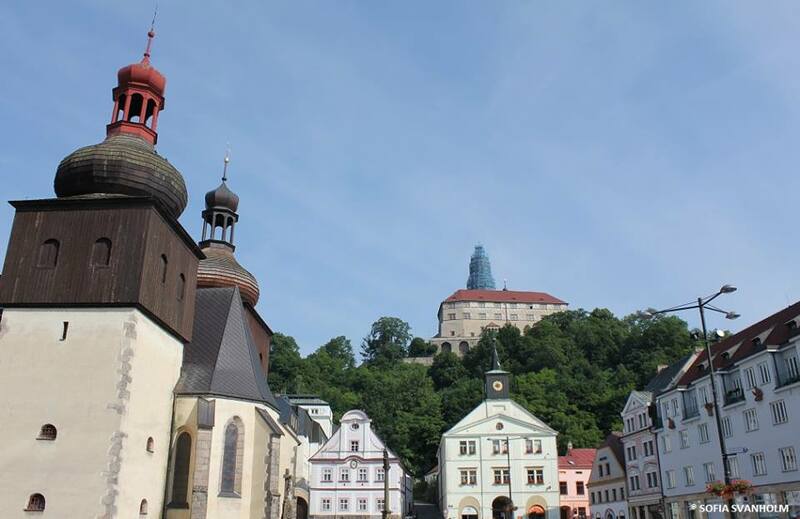 As we haven't done a Castleholics Anonymous in quite a while, I talked to Sofia (who has her own blog though we'll get a little more into that a bit further down) and out come loads of castle-seeing tips for Sweden - and the Czech Republic. I visited Sweden a bunch of times during my childhood for holidays. However, apart from the royal palace in Stockholm as well as nearby Drottningholm Slott, castles and palaces in Sweden are a bit of a blank page for me. Which other ones would you recommend for every Castleholic to see? My own two favourite royal residences of course, Rosendal and Rosersberg. Rosendal Palace, which despite its name is quite a small building on Djurgården in Stockholm, easily accessible via tramline and a brisk walk, is like a gorgeous bonbon of the Empire style with its typical exclusive French carpets, furniture, curtain arrangements and walls covered in lush colours of silk fabrics, plus lots of details and furniture featuring guilt bronze and gold. 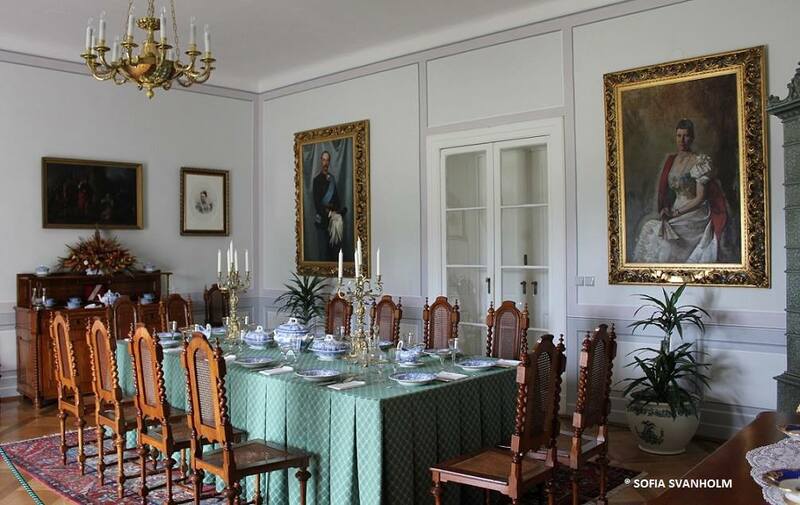 Rosendal was never a permanent residence but more of a pleasure palace where the royals would enjoy the warm season, it was built in the second decade of the 19th century and was probably one of the first Swedish prefabricated houses. 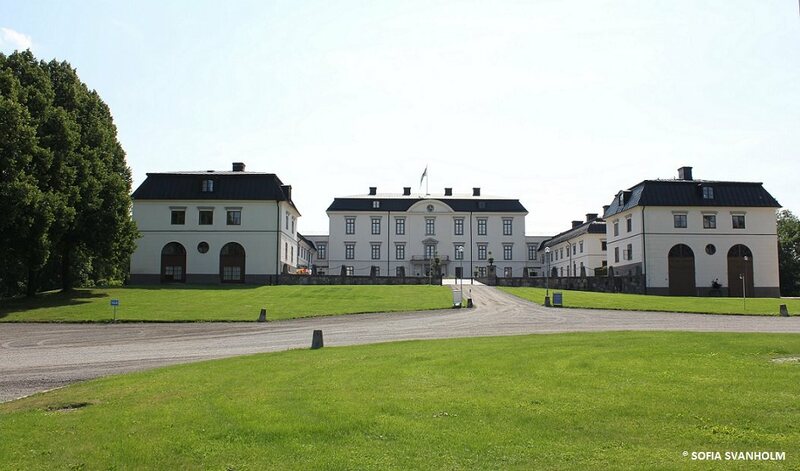 Since 1907 it stands as a museum and testament of the first Bernadotte king, Karl XIV Johan, and his time. Rosersberg Palace lies 3-4 miles north of Stockholm and is easiest reached by car. Although I’ve never been on a tour there with more than just a few people, this palace gets visitors interested in high quality interiors from far and wide. After being purchased by the state for the future King Karl XIII in the 1770’s it was given a makeover from its baroque look to become a classicist residence with state rooms in late Gustavian style hinting at antiquity in a work led by Jean Eric Rehn. In the 1800’s the first Bernadotte king, Karl XIV Johan, added some Empire style with a famous bedchamber with green silk covering the bed and walls, also featuring columns in white and gold. Rosersberg is unique in that it has had no royal resident since 1860 and thus the permanent interiors have since been left untouched, they have only aged but not been worn by frequent use. So if you are interested in high class interiors, accepting that this is not a royal residence which is used and decorated with “modern” personal mementoes, then this is a must-see. Are there any additional places one should see, maybe related to the royal family? When visiting Stockholm I would also recommend every royal watcher to visit the Riddarholmen Church not far from the Royal Palace, the royal and other crypts there are not open to the public but one can look at all the personal (to the holders) Order of the Seraphim shields mounted on the walls after the deaths of its knights, and also the Royal Burial Grounds at Haga in the Haga Park only a bus ride from the inner city, where on Thursdays during the summer months you can see the royal graves which began with that of Crown Princess Margareta née Princess Margaret of Connaught. Located in a part of the Royal Palace of Stockholm is also the Royal Armory, there you can learn about the Swedish royal history and see exhibited items from past to present. Another interesting place for royal watchers, on Djurgården in Stockholm with a tram stop not far away, is Waldemarsudde, the former home of Prince Eugen (1865-1947). 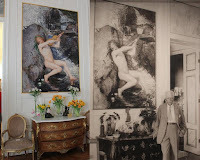 At his death he left his vast art collections and personal home, called Waldemarsudde, to the state and it is today a museum. There you can get to know Prince Eugen a little bit and enjoy art, some painted by the prince himself, at the same time. And any special recommendations for non-royal places? 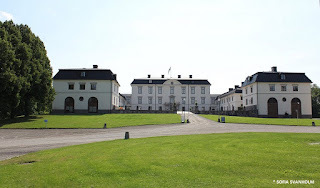 When it comes to non-royal castles and palaces there are hundreds of them in Sweden, the most interesting ones, of which many are still on my wish list, are private and closed to the public. There are however some exceptions and some places which are occasionally open. One place that is today a full-time museum is the Hallwyl Palace in Stockholm, it’s a city palace from the late 19th century which is a museum of the same kind of style as the Frick in New York and the Wallace Collection in London. 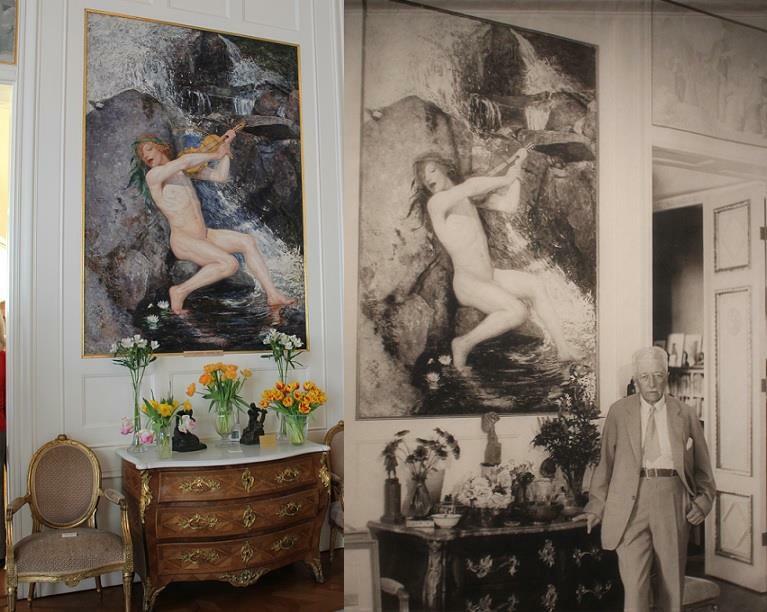 The Hallwyl Palace was built as the home of Wilhelmina von Hallwyl (1844-1930) née Kempe, the one with the money, and her husband Swiss citizen Walther von Hallwyl (1839-1921), the one with the title (from a HRE reichsgraf family), their business and Wilhelmina’s vast collections. The palace features beautiful rich high quality interiors, interesting art and collections and an interesting story. A little bit further from Stockholm, situated between Stockholm and Uppsala, is Skokloster Castle which is one of Europe’s best preserved baroque castles. Built in the late 17th century, this castle is also unique in how the stories above the ground floor have been left quite undamaged and untouched through the centuries as it passed in the founder’s daughter’s line as an entailed estate from 1701. Turning away from Sweden for a bit, you visited Prague a few years ago. The Czech capital is full of royal history – which places were your highlights? Prague was amazingly beautiful and fascinating. For someone like me, who loves classic architecture and high class interiors, it was quite the jackpot. Apart from the places me and my Danish friend, who I travelled there with, could actually visit, I found it so mind-intriguing to walk past so many former high nobility palaces in the city of Prague, and to come by abandoned once grand palaces and burial sites in the countryside as we travelled by train. It was also fascinating to be able to discuss Czech history with a royal watcher living in Prague who we met up one night with for dinner. I had only had a vague idea of the consequences of the German occupation in 1939, the consequences of the so-called Beneš decrees issued between 1940 and 1945 which led to the displacement of more than three millions ethnic Germans and Hungarians from the Czech lands, the freeing from the Nazis in 1945 and the communist regime takeover in 1948, and although I can’t say I’m well-read on these topics now either I can say that my respect for people who dare to discuss these sensitive topics has grown considerably since this trip. 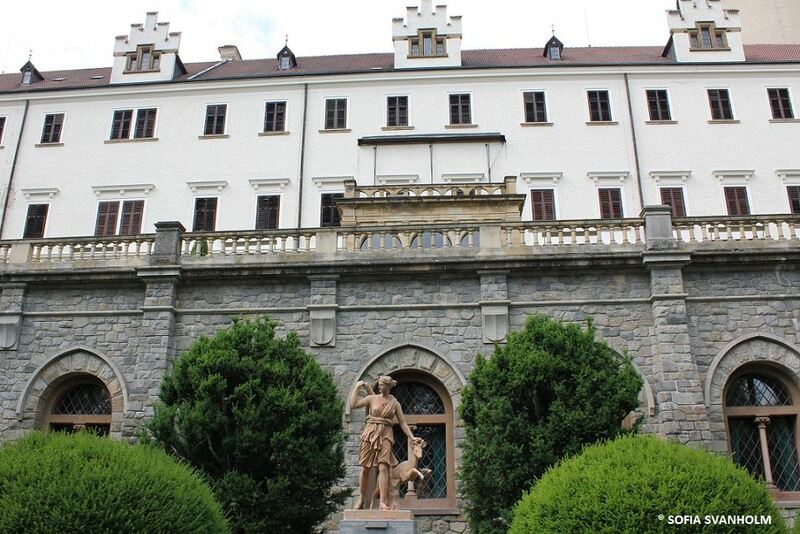 In Prague the highlight was definitely the Lobkowicz Palace in Prague Castle where parts of the family’s amazing collections are displayed and their history briefly presented. Although not knowing the Czech language was a barrier to learning as much as I wanted on topics like the Lobkowicz family, I found they had done a really good job in presenting the palace in a visually nice way at the same time as they told their story in such manners that everyone could begin to grasp it. I found the stories told by Martin Lobkowicz via audio presentation especially touching, when he died a few years ago I couldn’t help thinking about how much history and how many stories the world lost with him, may he rest in peace. Did you also see anything outside of Prague? 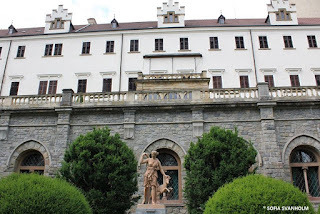 From Prague we did many daytrips, all of them wonderful but one was perhaps a little bit special as it had been in my wish list for years – Konopiště Castle in Benešov about 50 kilometres from the capital. Although the castles’ history begins in the 13th century it is most known as a favoured residence of Archduke Franz Ferdinand and his wife Duchess Sophie of Hohenberg, the archduke purchasing it in the late 19th century with the d’Este inheritance. Apart from being really impressed by the castle and its location and getting the idea of the archduke as a hunting maniac confirmed by the castles’ many hunting trophies; one also got a really good sense of their family life and the seemingly good childhood they gave their children while the family was still complete. 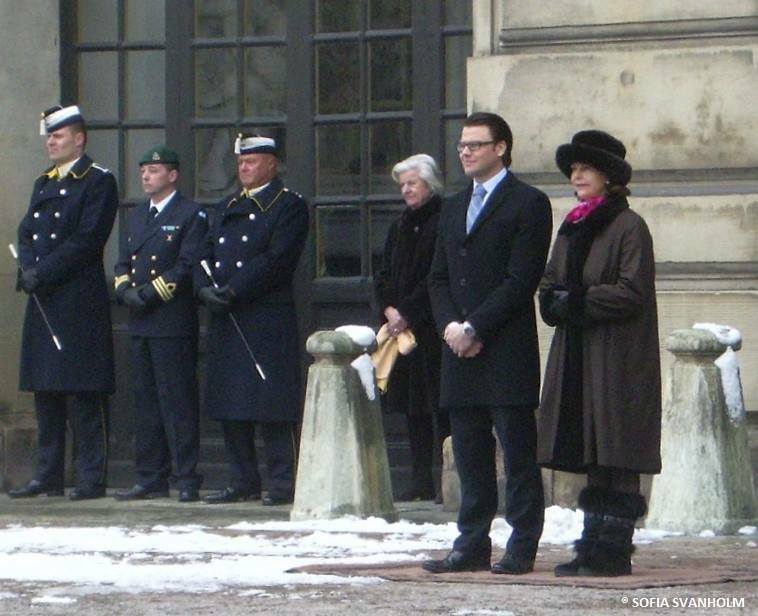 Over the years, you have witnessed many events of the Swedish royal family first hand. Could you say which one was your favourite and why? I have to say one event which may sound boring to some, especially if you were not there, but it’s one experience that has stuck with me ever since – Crown Princess Victoria’s name day in 2009. 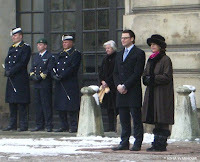 It was only a few weeks after the Crown Princess’ engagement to Daniel Westling and this day was his first official appearance on royal duty. He came out into the Inner Courtyard after his fiancée together with Queen Silvia and quite soon it became evident how well he and the Queen got on. They stood at that one spot together for the entire time, chatting away, unlike these days when he walks out with the Crown Princess to greet the crowds together with her. The Crown Princess was radiating with happiness, as were the Queen and Daniel Westling, and there were many courtiers out to watch the event. Somehow there was a special feeling in the air, everyone knew that something big was coming and things were going to change forever. When I asked you, whether I could interview you, you agreed (obviously) – however, you said to me “just don't call me a blogger [anymore]”. Sometimes I also struggle with blogging, would you care to share your reasons? And is there any hope that you will continue at some point in the future? For one thing my confidence has often played its trick on me, as much as I like writing and blogging I often start circling the thoughts that I haven’t had time to research as much as I would like and oh how easy it would be for one of the expert types to pick apart what I write. Another thing is not wanting to write too much generic and easy or light posts, but one the other being afraid of writing longer and more researched ones as well, fearing people will (as some sadly often do) simply copy and paste and let things live on forever in other forms on the Internet. Thirdly I would say that I’ve also always felt a bit alone in blogging, I would love to have someone to discuss, critique and structure things with. But I also have to confess that I haven’t exactly prioritized making time for blogging in my life either, also not during periods when I’ve wanted to continue or take it up again. A part of me has never given up the idea of keeping a blog, another part of me left that long ago. I keep pending back and forth. The jury is still out. Looking ahead to the future, do you have any plans for castles to visit this year? And which are the most prominent royal sights on your bucket list? Well for this year I’ve pretty much spent the most of my travel budget on a very expensive two-week tour of the Cotswolds this summer, so I’m afraid there’s not much of any castle-visiting left to do after that trip and some mini-trips in Sweden. However, in December I’m planning a long weekend in Copenhagen, hoping to meet up with two Danish royal watching friends, and then I’ll probably re-visit Amalienborg to see the current exhibition. As for my bucket list, oh my do I have one! I actually have very well structured travel wish lists with particular space for castles, palaces and other royal sites. Only a lottery win remains to make seeing all of these come true, so until then it’s a tough priority one has to make when planning trips of any kind. Hoping to get a driver’s licence in the future, I really want to travel around in Germany more. There are so many places to see there and I’m thinking when possible to drive one could prioritize and divide it all up to make a few trips to specific regions. One just needs to mention places like Hannover, Wiesbaden, Darmstadt, Karlsruhe, Dresden, Weimar, Coburg, Sigmaringen and Würzburg to get an idea of the kind of trips possible.